Place your salmon on an oiled roasting tray and season with salt and pepper. Gently warm the honey with the juice of one lemon and pour over the salmon. Roast for 12 minutes, basting occasionally. You can add the salmon either hot or cold to your salad. Put the eggs in cold water on a high heat. When the water starts to boil, leave the eggs to cook for 3.5 minutes before removing and placing in a bowl of cold water. Add some salt to the boiling water and add the potatoes. Make sure they are all a similar size or cut them so that they are. Smallish ones will need 10-12 minutes. Whilst the potatoes are boiling, quickly blanch the broad beans, only for about 1 minute. Place them in cold water and shell each one to really get the best flavour and texture. Heat a good sized knob of butter in a pan and add the salted capers and the broad beans. Heat through, before adding the cooked potatoes so that the butter coats everything. Season with black pepper. Peel the eggs and slice in half lengthways. 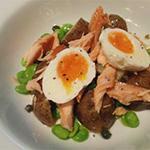 Plate up your potato and bean mixture, flake over pieces of the honey roasted salmon and place the egg halves on top. In boiling water, quickly blanch the tomatoes for a minute. Remove and place in a bowl of cold water - this will make the skin easier to remove. Once cool enough to handle, cut out the area where the stem was and gently peel away the skin. Then roughly chop the tomatoes, discarding the seeds if you prefer. Slice the courgettes lengthways to produce long, wide strips and put to one side. Rub the red snapper fillets with salt and pepper. Heat the olive oil and garlic in a large frying pan over a medium-high heat for a couple of minutes then add the snapper fillets. 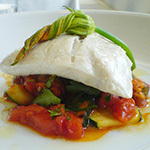 Cook for 3 minutes, then turn and add the tomatoes and courgettes. Cover and let cook for about 10 minutes, shaking the pan now and again to make sure the sauce is evenly distributed. Add the parsley before serving. For the wow factor, decorate with a fresh or deep-fried courgette flower. This simple recipe is a wonderful way to enjoy our velvety French apricots this summer. Try it hot or cold, dolloped on fresh yoghurt, scones, vanilla ice cream or simply with cream. Wash the apricots, then halve and stone them. Heat the water and sugar in a medium saucepan. 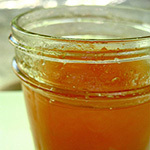 Add the apricots and cook on a low heat for 30 minutes, stirring often.